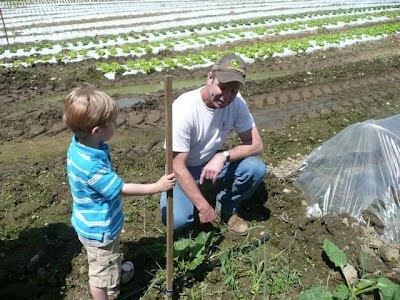 Steve’s farm consists of 100 acres of farmed lands of mixed fruits and vegetables. His fruits include small plants such as strawberries, blueberries, and raspberries and he has fruit trees – about 20 varieties of apples, peaches, plums, and pears. His vegetable crops include corn, tomatoes, peppers, carrots, beans, peas, broccoli, cauliflower, kale, brussel sprouts, fennel, celery, lettuces, and many other greens. Steve’s motto is to create ‘safe food’ which translates into safe for not only eating but also safe to produce by farm workers. He uses integrated pest management (IPM) methods being very conservative with anything that is put onto the plants. Steve doesn’t use GMO (genetically modified organism) seeds. Steve participates in 8 farmers’ markets including Melrose plus his farm stand.